Within a couple hours of starting the PS4 version of Downwell, I got to the final level for the first time. I put several hours in on the PC version last year and never got even close to reaching it, always foiled by the swarms of stuff in the penultimate level. Upon making it to the end, however, I died immediately due to a careless mistake. (I accidentally jumped down to where the boss was with only a single hit-point left.) After such a crushing defeat, I was about ready to swear off this game forever and never touch it again. Five minutes later I launched the game again and gave it another shot. 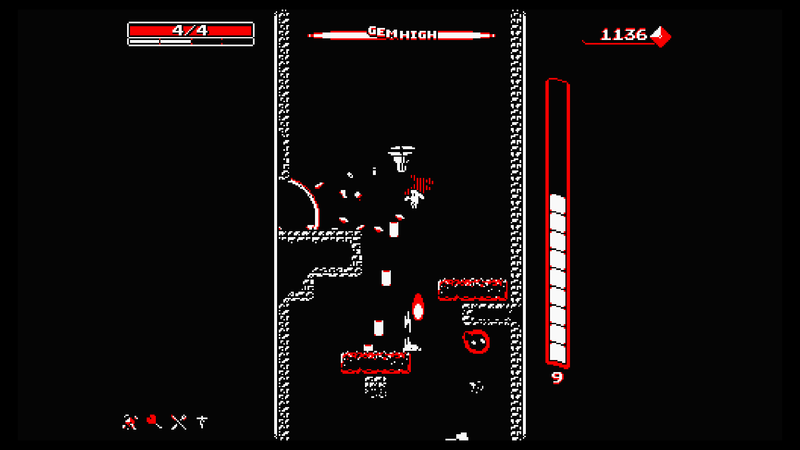 Downwell is a good example of the “just one more run” kind of game. Its simple mechanics and quick playthroughs make it a perfect short-time game and a dangerous time-sink; easy to pick up, hard to put down. The premise is simple. You’re a guy falling down a well, fighting off all manner of creatures along the way using his gunboots. Why he’s descending the well is anyone’s guess. What matters is you need to reach the bottom. You fall through four different environments, bouncing off ghosts, bats, skulls, squids, and such all the while. There’s a few different ways you can achieve your goal. Steadily make your way down, stopping at each patch of land you find, slaying anything that gets in your way to grab as many gems as possible so you can pay to restore your health or keep your gunboots charged. You can also bounce off of enemies as you go to build up combos that in turn grant you additional gems, hit-points, and energy. Or you can just avoid all those things entirely and just focus on descending. Ideally the game expects you to build combos, as it’s ultimately the most efficient way to play. It’s also the most risky. The speed at which you fall makes it very easy to miss your mark. Your gunboots can slow your descent, but if you have a module that uses a ton of energy, like the laser or shotgun, for example, you have to be a lot more careful with when you use it. I always ended up with a ton of gems playing like that, but I also took a ton more damage in the process. Assuming I found a shop, I could mitigate that lost HP easily, but that also assumed I would have survived long enough to make it to the next one. I’ve found the most success taking a more balanced approach, racking up combos early on then playing more methodically over time. The game attempts to dissuade you from taking it slow in later zones by littering the field with traps or forcing you to race against the clock, but those obstacles are more menacing in theory than in practice. It helps the game walk that fine line of difficulty to ensure it remains tough but fair. This is further compounded by the upgrades you receive at the end of each level. They range from mere health recovery items and passive abilities to additional support like drones or balloons. Every upgrade has some use, some more situational than others, which helps make each run unique in how you make the best use of the upgrades available to you. You can’t always count on certain abilities being available when they’ll be most useful, so you’re constantly evaluating what would work best and whether you should take your chances and see if something you don’t need now but might require later will reappear. At the end of a run, your gems are added a grand total that unlock new styles and color palettes at certain milestones. Styles are modifiers. Arm Swing style, for instance, only finds gun modules and makes shops rarer. Also your character’s arms swing while running around. Boulder Style grants a couple extra hit-points, but reduces the number of upgrades available at the end of the level. It also makes them roll around. The styles add a nice bit of variety – an extra couple hit-points makes a huge difference – though I never really felt compelled to use anything other than the default. Color palettes alter the look of the game (and there are a lot of them), as well as the lightbar on the controller for the PS4 version. There’s also a hard mode that unlocks if you complete the game, although I haven’t been able to check it out since I still haven’t been able to finish it, as each time I’ve reached the boss I’ve died instantly. At this point, I don’t know if I’ll ever finish Downwell, nor do I really care. Not because I don’t think it’s worth finishing, but because that doesn’t really seem to be the point of games like this. They’re not the sort you quickly plow through and toss aside once the credits roll. They’re meant to be played off and on in perpetuity, something to come back to every now and again when you feel the itch to play it. Downwell fills that role splendidly. It feels more suited to portable platforms in some ways given how quick each playthrough lasts, but at the same time, playing this with a controller feels right. Regardless of where you play it, you’ll surely fall for Downwell.